The five most popular stories in the past 24 hours, according to NewsPulse. Nine years after 9/11, photo provides peace: Judson Box has never known exactly how his son, Gary, died on September 11, 2001. But an unexpected find nine years later has given him a glimpse into his son's final hours. Florida reverend calls off Quran burning: The pastor of a Florida church says his congregation has decided to call off the burning of the Quran that was to be held Saturday - the ninth anniversary of the September 11 attacks. Stabbing girlfriend was a mistake, actor says: The "40-Year-Old Virgin" actor Shelley Malil testified Thursday he stabbed his girlfriend 20 times when he wrongly thought that she was somebody else going after him in the dark. 'Prince of pot' gets 5 years in U.S. prison: The man once known as Canada's "prince of pot" is now a federal inmate in the U.S. system after a judge in Washington sentenced him Friday to five years in prison. Belgium's Kim Clijsters defeated Russia's Vera Zvonareva 6-2, 6-1 Saturday night to win her second consecutive U.S. Open title and her third Grand Slam title. The win makes her the first woman to win two consecutive U.S. Open titles since Venus Williams, whom Clijsters beat Friday night to advance to the final round. The no. 2-seeded Clijsters accepted her trophy before a cheering crowd in New York's Arthur Ashe stadium after encouraging Zvonareva to keep fighting toward the title. "A little bit of experience definitely helps," she said. "I think it took me six or seven finals until I finally got one. "Keep it going," she told her opponent. "You're a great player. It'll happen." The 27-year-old married mother will also receive $2.2 million for her win. Zvonareva congratulated Clijsters, saying that despite the outcome, "I still love New York." Clijsters came into the match with 20 consecutive wins after defeating Williams, who snagged back-to-back titles in 2000 and 2001. The no. 7-seeded Zvonareva upset top-seeded Caroline Wozniacki on Friday to face off with Clijsters, whom she had beaten twice previously. More coverage of the U.S. Open on SI.com. Nine years have passed since the September 11 terrorist attacks, but the pain felt by the families of the victims is still intense. CNN's Steve Kastenbaum sat down with a woman who lost a brother who was also her best friend. 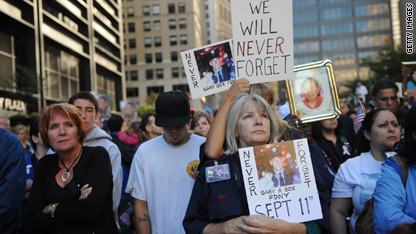 Nearly 60 victims of the September 11 attacks were Muslims. CNN's Steve Kastenbaum spoke with the mother of a Muslim New York City police cadet who died in the attacks about growing anti-Muslim sentiment. California Sen. Barbara Boxer demanded answers Saturday to questions about why a gas transmission line ruptured in a suburban San Francisco town, triggering a massive fire that killed four people and left two people still unaccounted for. Accompanied by state and federal officials, the Democratic senator toured blocks of the charred neighborhood in San Bruno that now looks like a war zone. She saw firsthand the intensely hot fire's wrath: melted cars, burned out skeletons of houses. At a news conference later, she said it was hard to put into words how a beautiful neighborhood almost disappeared. A judge on Saturday ordered a man - arrested and charged with weapons violations after a small explosion at a Danish hotel - to be held in custody until October 4 while an investigation into the incident continues. Police said they have not ruled out the possibility the act was terror-related. Nine Septembers have come and gone and yet, the many days that separate America now from a chilling day in its history did not dull remembrance Saturday. Once again, the nation paused in silence to mark the times when hijacked jets crashed into the World Trade Center, the Pentagon and a field in Shanksville, Pennsylvania, and nearly 3,000 lives were lost in a matter of minutes. But this year, a national debate over a proposed Islamic center near ground zero hovered over the day's heart-stopping sorrow, and the president once again pleaded for the tolerance that has come to define America. Rallies in favor of and against the center were held later in the day. Filed under: Al Qaeda • Anti-Islam • Barack Obama • National security • New York • Pennsylvania • Terrorism • U.S.
Two people are still unaccounted for in San Bruno, California, where a gas-line rupture caused a massive fire, U.S. Sen. Barbara Boxer told reporters Saturday. Four people were killed and 52 were injured in the blast and fire that leveled 37 homes and damaged eight. 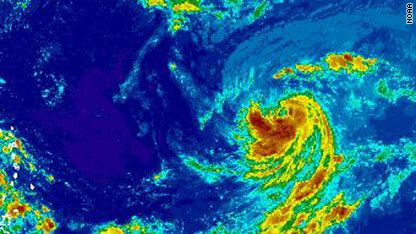 Tropical Storm Igor's winds were blowing at 70 mph (110 kph) and strengthening Saturday, and the storm was likely to reach hurricane strength before the night is over, the National Hurricane Center said. At 10 a.m. ET, Igor was about 1,470 miles (2,365 km) east of the Leeward Islands, headed west at 20 mph (32 kph), the center in Miami, Florida, said. The storm has the potential to reach Category 4 strength, forecasters said, but it isn't expected to reach the islands of the Caribbean sea for several days. President Obama spoke at the Pentagon, Vice President Joe Biden appeared at New York's ground zero, and first lady Michelle Obama - accompanied by former first lady Laura Bush - addressed listeners in Shanksville, Pennsylvania, on Saturday in observance of the ninth anniversary of the terrorist attacks of September 11, 2001. "The highest honor we can pay those we lost, indeed our greatest weapon in this ongoing war, is to do what our adversaries fear the most - to stay true to who we are as Americans, to renew our sense of common purpose, to say that we define the character of our country and we will not let the acts of some small band of murderers who slaughter the innocent and cower in caves distort who we are," the president said. Biden, joined by his wife, Jill, New York City Mayor Michael Bloomberg, New York Gov. 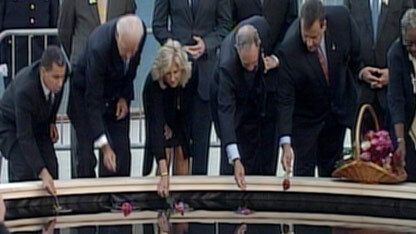 David Paterson and victims' family members, placed flowers in a pool at the former site of the World Trade Center. Filed under: Al Qaeda • Barack Obama • New York • Pennsylvania • Terrorism • U.S. The lawyer for three U.S. hikers accused of spying in Iran is "upset" that Sarah Shourd's planned release has been canceled and said her family's emotions are "being abused." 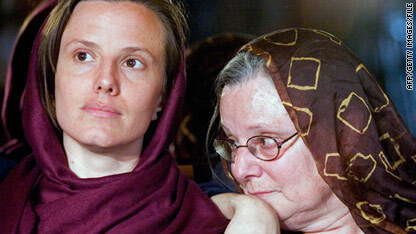 "Put yourself in her mother's shoes.," Masoud Shafili said on Saturday. "It's been more than year and she has no idea why her daughter was arrested and what will happen to her." Iranian officials had said on Thursday that Shourd, one of three American hikers held in Iran for more than a year, would be released this weekend. But Friday, prosecutors said the release had been "canceled" because the judicial process has not been completed. Shourd, 32, along with Shane Bauer, 28, and Josh Fattal, 28, were detained July 31, 2009, after they allegedly strayed across an unmarked border into Iran while hiking in Iraq's Kurdistan region. Controversial Florida pastor Terry Jones told NBC's "Today" show Saturday he's decided to cancel the Quran-burning event to have been held at 6 p.m.
"I can absolutely guarantee that there will never be a Quran burning at our church," Jones told NBC. "We will definitely not burn the Quran." Earlier Friday, Jones gave mixed messages about whether he intended to carry out his plans, which have sparked international controversy and protests in the Muslim world. U.S. military leaders said the event would imperil the lives of troops abroad. President Obama said Friday that the idea that "we would burn the sacred texts of someone else's religion is contrary to what this country stands for." Filed under: Anti-Islam • Florida • National security • Religion • U.S. The Rev. Terry Jones, the Florida pastor who has garnered worldwide attention for his plan earlier this week to burn Qurans on September 11, arrived in New York City late Friday night, according to footage provided by CNN affiliate WABC.